This is an evolving collection of articles about track races that took place in 1908. This article reports the tragic death of Emanuel Cedrino. Cedrino was a successful European road racer who came to the United States to develop his craft. 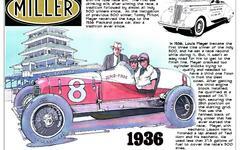 He won several races and set speed records, including time trials at Ormond-Daytona Beach. These articles from the Indianapolis Star pertain to the auto race meet on Saturday and Friday September 19-20 1908 at the Indiana State Fairgrounds dirt horsetrack oval. The meet was a star-studded affair with the likes of Barney Oldfield, J.